You’ve probably read my reviews of Zapzapmath and Zap Zap Kindergarten Math, as well as the constant updates they make to their free (and freemium) app. This gamified math ecosystem is popular with students because it’s fun and teachers because it ties into many national and international standards (like Common Core). Its format is colorful and engaging, music lively, and layout intuitive. Now, Zapzapmath has introduced a new option called Zapzapmath Home. These free grade-level apps for iOS and Android are aimed directly at home use to support students who want to learn math at home with fun games, enticing videos, and the same clever interface they experience in school. By gamifying math in a way that wraps personalized learning with real grade-level tools, Zapzapmath helps students change the way they think about math from an activity that occurs within the walls of the schoolhouse to one that can happen anywhere. 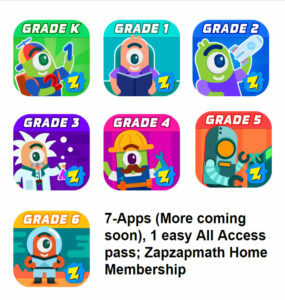 Zapzapmath Home includes a scaffolded system of seven apps, one for each grade level from K-6. Each app is free to download and comes with a couple of free games that provide a solid preview of how Zapzapmath teaches math, letting you decide whether it’s right for your child. In this app, kids learn to count to 20, use numbers to represent the number of objects, addition and subtraction, measurable attributes, and shapes. Using this app, children will learn to apply different strategies for addition and subtraction, understand place value, measure and compare lengths, tell time to half hours, and understand shapes and their attributes. This app lets children work with addition in a way that will help them understand multiplication, get to know place values up to hundreds, measure and estimate lengths, work with time and money, and reason with shapes and their attributes. Children can use this app to learn about multiplication and division, the relationship between place values and arithmetic, fractions, measurement problems involving time, liquid volume, and mass, area and perimeter, and reason with shapes and their attributes. This app helps players understand the concept of factor pairs, figure out number patterns, relate place value with multiplication and division, round numbers, find equivalent fractions, understand decimal notation for fractions, represent and interpret data, understand and measure angles, draw and identify lines and angles, and classify shapes by their lines and angles. Players can use this app to learn about writing and interpreting numerical expressions, solve math problems with decimals to hundredths, know how to multiply and divide fractions, convert between measurement units, understand volume and relate volume to multiplication and addition, graph points on the coordinate plane, and classify 2D figures based on their properties. This app helps players learn about ratios, dividing fractions by fractions, finding the greatest common factor, understanding the concept of rational numbers, solving equations and inequalities, solving problems involving area, surface area and volume, and understand statistic variability and distributions. Want to test before downloading? Go to Zapzapmath’s Facebook page or Zapzapmath On the Web and play free. There are 180 math games included in the full program. Zapzapmath Home players can use math skills to create a city. Educational cartoons help explain math concepts. Players can create a customized avatar. Each registration includes three unique profiles for different users. Though each app is separate and includes some free (some fee) content, you can purchase a Home Membership that gives you access to all content at all levels for all profiles registered under the account. 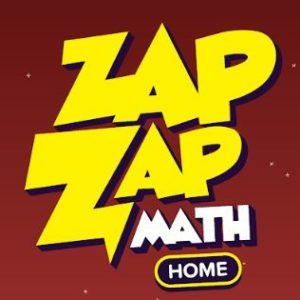 While I found both Zapzapmath and Zapzapmath Home intuitive and quick to learn, you can find help on Zapzapmath’s YouTube channel, with everything from animated basics to playlists of math skills. With its bright colors, appealing characters, and friendly ecosystem, Zapzapmath is a robust addition to every home-based education program.